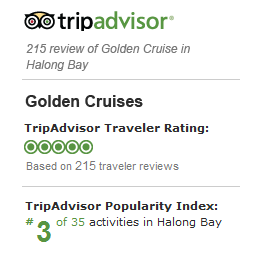 Golden Cruise is one of the biggest and most luxury brand cruise in Halong Bay. The finest details of this luxury cruise provide genuine experience for exclusive travellers to enjoy lifetime experience on vacation to one of the seven natural wonders of the world heritage. Today, the Golden Cruise 9 - known as traditional wooden boat edition of the Golden Cruise in Ha Long Bay. With 18 Executive Cabins, travellers can expect the highest standard of professional service and personalised service, finest dining experience and luxurious facilities. Imagine the world where everything is included, where luxury comes with traditional and all wish will be cater by the team of specialist crew of Golden Cruise 9. From the welcoming atmosphere to the outstanding dining venue and luxurious cabin. Golden Cruise 9 is a traditional luxurious cruise in Ha Long Bay, consist of 18 Executive Cabins on both first and second floor at approximately 12 square meters built in and sightseeing from windows. The Cruise consist of Executive Twin Room, Executive King Room and Executive King Room with extra bed available. Each cabins is installed with individual air conditioner. The Golden Cruise 9 's restaurant located on the first floor offer a luxury dining experience for passenger with a seating capacity of 36 passengers. The restaurant architecture are furnish with all royal wooden furniture. Passenger have the great opportunity to see the beauty of scenery while dining . A 48 inch Plasma Television located in front of the restaurant, provide a luxury atmosphere to cater private event upon request. Bar on the restaurant served all kind of beverages, beer, spirit and range of vintage wine. The restaurant served variety of local and international cuisine to cater all passengers worldwide. Special food will be served to passenger upon request. The buffet station in the middle of the restaurant served all kind of international cuisine. The safety on Golden Cruise 9 exceed all safety requirement with life jacket , glass hammer and fire extinguisher place in each of the cabin which will be brief during the arrival. First Aid Kit is available for all passenger on board. Beside the cabin , the vessel had place all safety instrument such as survival suit, life boats on sun-deck, life rings with emergency strobe light. The vessel’s marine safety team lead by the captain on board are well trained and certified by the local authority. The Cruise Manager conduct all safety procedure and providing information during boarding the cruise.